You walk in your garage, turn it on, and it starts making an awful noise. What’s the first thing you think of to fix it? WD-40! The same thing you use to fix all squeaky hinges. We’re here to tell you why WD-40 is NOT the solution when it comes to your garage door. Why does your door need lubrication? The bearings and springs come lubricated initially, but with passage of time, and weather effects, the layer of lubrication tends to come off and eventually dries. Several parts of your garage door require frequent lubricating because your garage door is one of the biggest moving parts on your home. The springs, rollers, tracks and hinges all need some attention once every few months to keep the garage door functioning smoothly. Your lubrication process will vary depending on your door’s configuration. These parts of your door require proper lubrication for proper working. WD 40 is abbreviated from the term 'Water Displacement, 40th formula'. It serves as penetrating oil and water-displacing spray. WD-40 is not a long term lubricant. It is a short term lubricant, cleaner and rust preventative. You may use WD-40 to remove tar off your hands. It is recommended to use WD-40 to remove Crayola marks from a variety of surfaces. Of course it is also very useful for fixing squeaky car and home doors. But it is not the solution for your garage, and we’re about to explain why. Why You DON’T Use WD40 On Your Garage Door? 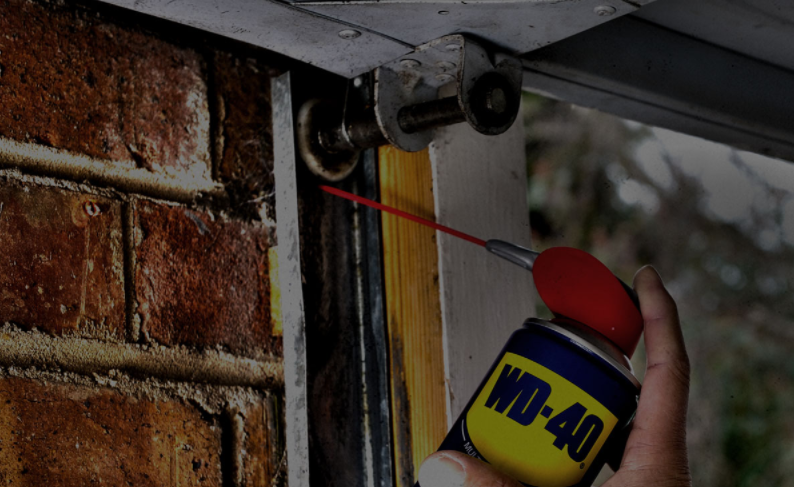 When used on a garage door, WD-40 will strip the oil from metal components, therefore removing any lubrication. You now end up with metal on metal with no lubricating oil to reduce friction and quiet down the door. This is why the garage door will actually get louder over time after applying WD-40 to all moving parts. Even though is not recommended to use WD-40 to lubricate your garage door, you can use it to clean the garage door tracks. It works well at removing any grease or debris that has built up over time. Break cleaners also work well. Instead of WD-40, choose a silicone spray or white lithium grease to lubricate those moving parts. Aerosols are especially well-suited for injection into small moving parts. These materials won’t attract dust and won’t even gum up like mechanic’s grease or engine oil. Remember with the use of right lubricants, you may find your garage door working far better and for much much longer.